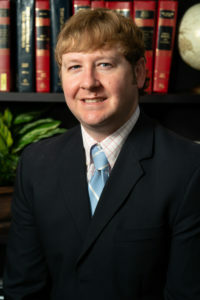 Perry Greer joined Moore Ingram Johnson & Steele in 2019 as an associate in the firm’s Lexington, Kentucky office. Practicing primarily in Workers’ Compensation Defense and Insurance Defense, Perry is a member of the firm’s Civil Litigation department. Perry was admitted to practice in all Kentucky courts in 2008, and is also admitted to practice in the United States District Courts for the Eastern and Western Districts of Kentucky. Born and raised in Lexington, Kentucky, Perry attended Transylvania University, where he graduated with a Bachelor of Arts degree in History in 2005\. Upon graduation, attended the University of Kentucky College of Law in Lexington, Kentucky. During law school, Perry served as the Chief Justice of the Student Government Supreme Court, and as a member and Administrative Editor of the Journal of Natural Resources and Environmental Law, now known as KJEANRL. He received the CALI Excellence for the Future Award in Litigation Skills. After graduating in 2008 and successfully passing the Kentucky Bar Exam, Perry has practiced at a number of firms in the areas of motor vehicle liability, premises liability, trucking, construction, and nursing home litigation throughout the Commonwealth of Kentucky. Perry lives in Lexington with his wife and two children and is a committed and fervent supporter of the University of Kentucky Wildcats.